As a North Carolina native, orchards and living rooms are normal concert venues. Stills from “The King’s Garden” video shoot. Play me an old song. Performing a school project at a coffee house in Boone. Dad and I performing at Leverin’s Orchard in Virginia. A favorite place! My parents backing me up in 2009. Dad playing lead guitar and mom playing the electric bass. That’s how WE roll! I’ve never been on a church sign before! 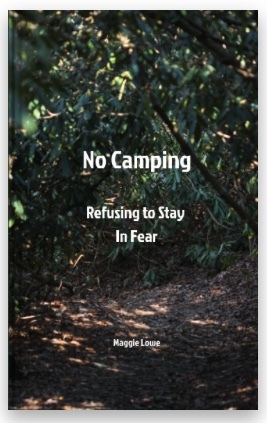 In January 2018, I had a special book and album release party to celebrate “No Camping: Refusing to Stay in Fear” and “Church in Broken Places”. And this is me demonstrating what the Easter Bunny looks like. Dad helping me out with my project on a song about the Vietnam war monument. I’ve written a book! You can find information on ordering it over in the sidebar of my site. I hope you enjoy it. Signing a book. I wrote a book?! ?